Let us begin by noting that I stayed home. I did laundry, cleaned house, washed dishes, and read a Mr. Darcy story – all the usual chores – but most of the day I was in search of future European lodgings on the internet. We are spending an inordinate amount of time doing this. Why did I reluctantly forgo the excitement of riding bikes along a beautiful river on a gorgeous sunny day? Spasticity. (I wanted to write “Spastics,” just because it sounded like The Graduate.) This is a pesky MS problem – stiffness and spasms that make movement tiring and uncomfortable – that comes and goes, depending on pain, stress, body temperature, outdoor temperature, infection, worry, anxiety, bad posture, uncomfortable clothing, a full bladder, and constipation. (I love that list, which I swear is not my own invention.) Needless to say, one experiences many of these things regularly, both in daily life and whilst traveling the world. How do I usually deal with it at home? Weekly therapeutic massage. It relaxes stiff muscles, increases flexibility and blood flow, and reduces stress. But I have not had anyone work on my leg since I left home, and I am definitely feeling it. There was no way in heck I was getting on a bike. However, we had promised Quinland a long bike ride, and had put it off already due to the weather. 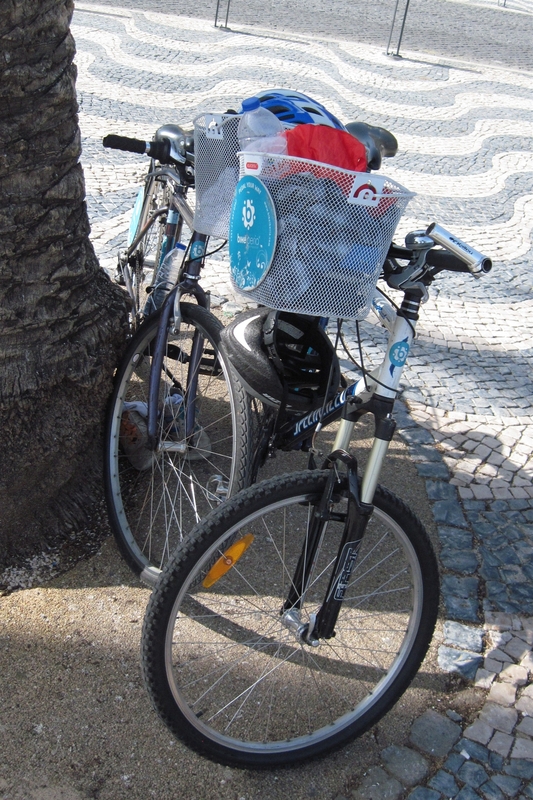 Luckily, he has a wonderful dad who rides bikes with him often, so the two of them headed off to the bike rental place at Cais do Sodré. 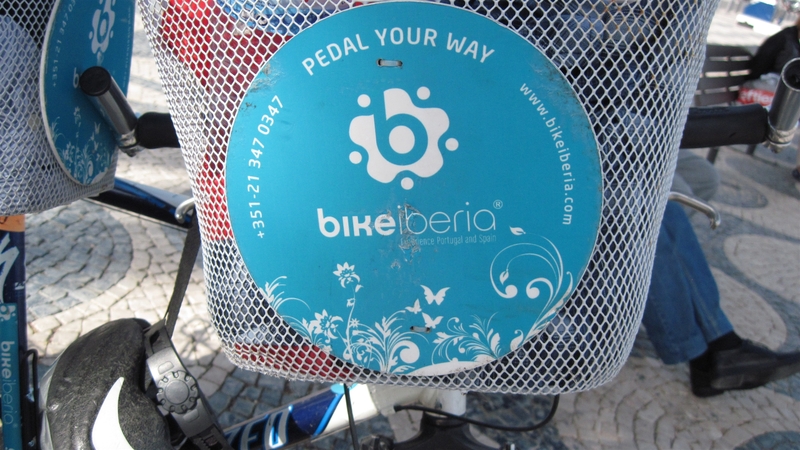 The bike rental place provided them with bikes, locks, baskets and helmets, as well as three things they did not expect: an extra bike tube in case of flats (which they did not know how to use), sunscreen, and a bathroom (both of which they did know how to use). The “super duper awesome” bike path was just a block away. Part of the path is cobblestone, but most is paved. Q fell on the cobblestones, but says, “It’s a million times better than falling on concrete or gravel.” The paved area has a painted line of dots down the middle to separate the lanes, with Pac-man appearing on occasion to eat up the dots. There is also word art painted on various sections, such as “Vroom!” when you are under the bridge with cars passing overhead. 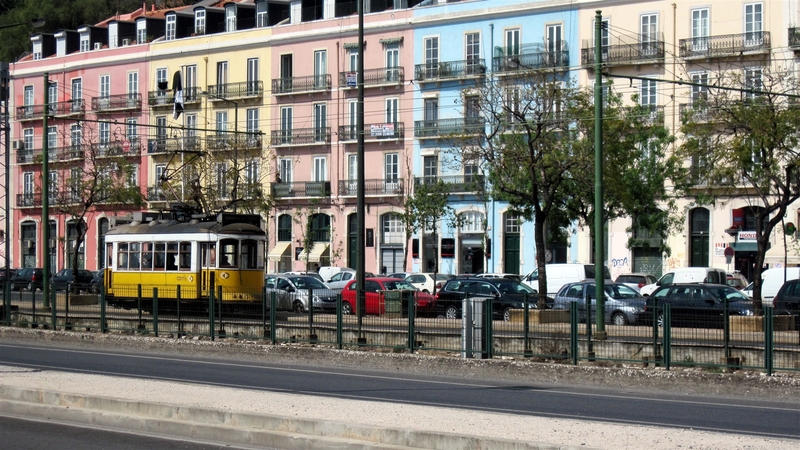 The path follows along the docks of the Tejo. Some areas have been developed as posh waterfront areas, and the bike path goes right through them. At one point, you “ride the gauntlet” right between restaurants themselves and the patio areas where their patrons are dining, dodging the waiters carrying food. Or perhaps they are dodging the bicyclists… The also saw a super-smooth roller-blading area and a few people riding on Segways, which are also available to rent. 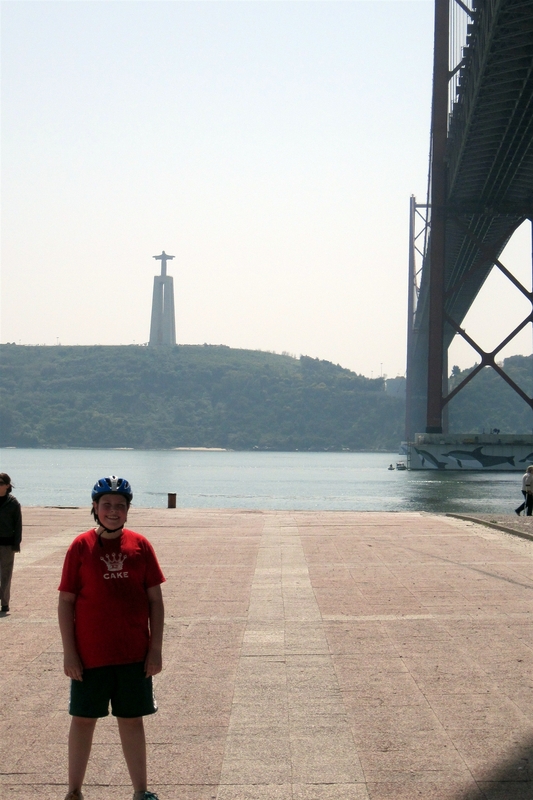 They rode from Cais do Sodré to Belém, going under the 25th of April Bridge, stopping to take a picture of the Museu Nacional de Arte Antiga in Santos. 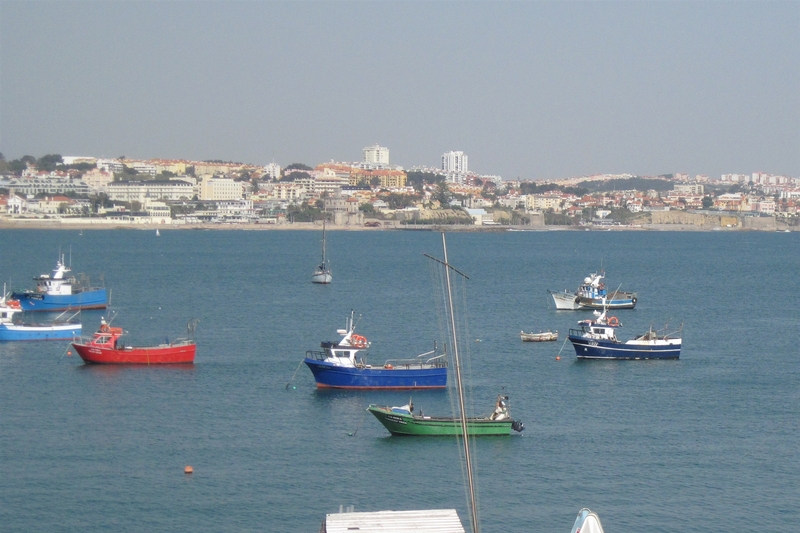 The plan was to catch the ferry in Belem, take it across the river, and then ride to some lovely beaches for the afternoon. The ferry was docked as they arrived, but – sadly – departed just as D & Q approached the ticket window. Better yet, the operators would then be going on their lunch break, so the next ferry would not be leaving for two hours. Time for a change of plans! David knew there weren’t really any other good beaches nearby, so they decided to take a train to a beach town. They weren’t sure if they could take their bikes on the train, or if there would be a surcharge for them. They started asking people. Waitress at snack bar: I’m not sure. Guy asked by waitress: I think so. Belgians: We have no idea. Girl who missed her train trying to buy a ticket: I don’t know! Random guy: Yes, you absolutely can, and there is no charge. They soon found out why that girl missed her train: the ticket machine would not take debit cards, charge cards, or bills. David tried every card and bill he had with him, to no avail. Quinland started for another ticket machine, but ran in to the Belgians, who said that one didn’t work, either. 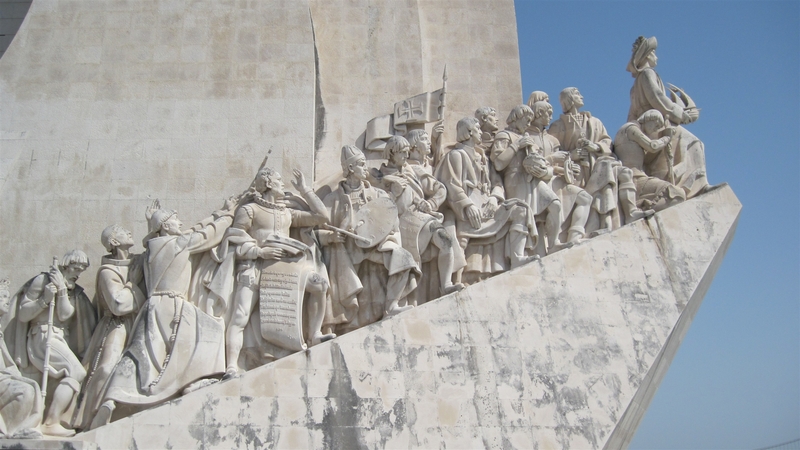 Obviously train travel was not in the cards, so they rode past the Monument to the Discoveries and headed over to the Torre de Belém to play frisbee in the park… until it occurred to them that they could ride to the next train stop, Alges, and see if the ticket machine worked there. It worked! 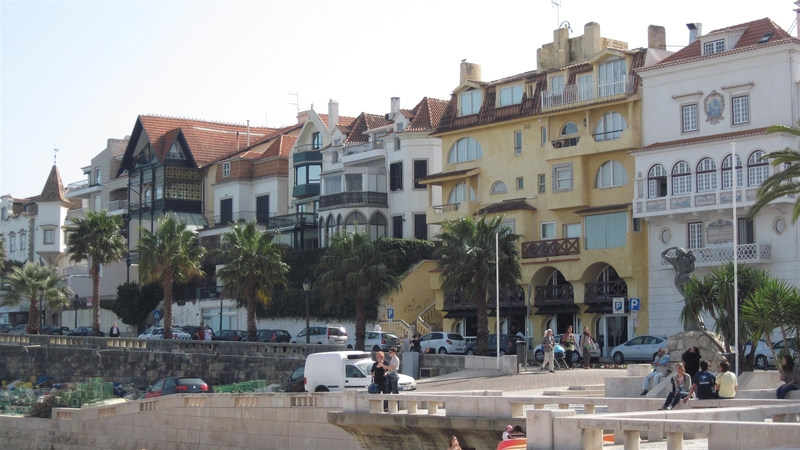 They bought tickets to Cascais, boarded the train, and saw… the Belgians! So they all rode the train together, chatting away. 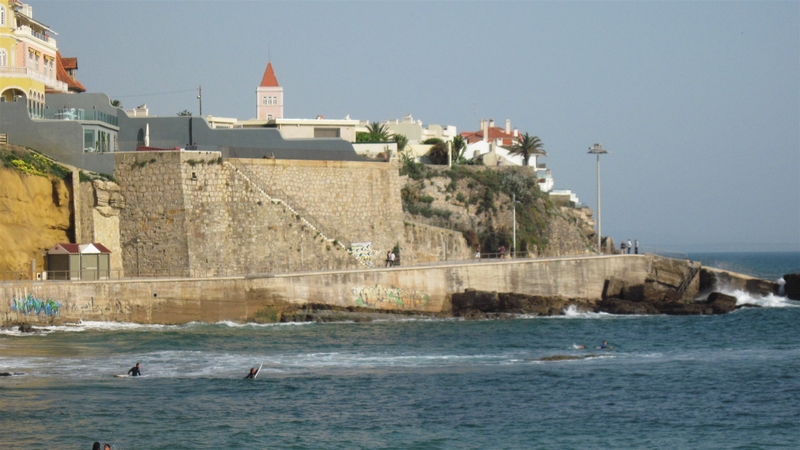 They rode down the hill from Cascais station, rode up a hill, asked Americans for directions, and then rode towards the marina against Quinland’s will. David wanted to go to where the Atlantic crashes against the river, but they didn’t make it there. (A kid had been promised a day at the beach, and a day at the beach he would have.) They turned around and went to the beach. Q played in the sand and went in the water, while David (and I quote) “sat on a bench.” Q says the water was as warm as California water. Then they took the train home, had dinner with the mama, and had a peaceful evening. Whew! It sure is. 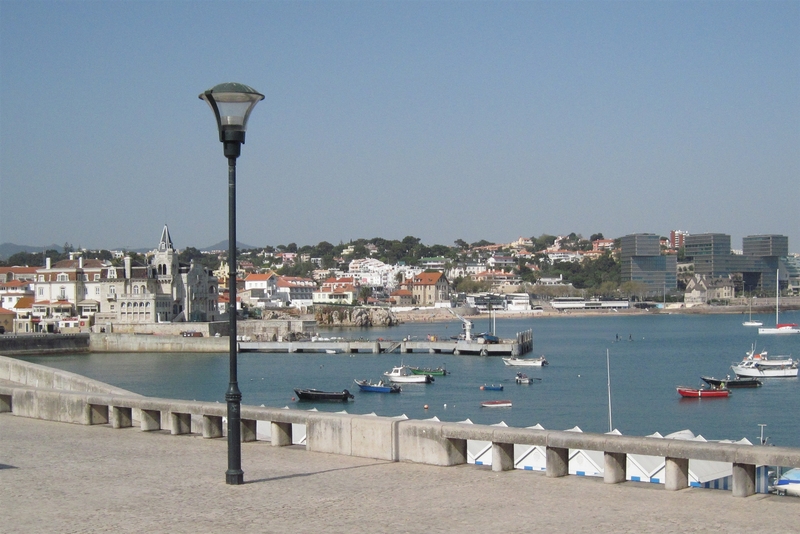 I got to see Cascais and Estoril when we were here back in the day… just lovely. Loving it! So much cheaper but a lot less fun living vicariously.